How do I configure the new "Home Sharing" feature in iTunes 9? I've enabled turned on Home Sharing in iTunes 9 on two computers (both running Mac OS X) on my home network, but I don't see how to tell it to share specific playlists or media types. Update: To answer tronpxs's question, iTunes is authorized to the same account on both machines. Let me elaborate on my question. I'm not having a problem with Home Sharing. I just don't see how to configure it. I couldn't find anything applicable in the iTunes online help. And it doesn't look like Apple has added anything on Home Sharing to http://www.apple.com/itunes/how-to/ yet. However there doesn't appear to be any way to sync just the media in specific playlists. iTunes 9 appears to allow you to share the libraries between two computers provided that the purchased items in the libraries are authorized for the same apple id. First machine - start Home Sharing. iTunes will ask you to enter the account password and then turn on Home Sharing. Second machine - start Home Sharing. iTunes will ask you to enter the account password and then turn on Home Sharing. You should see the first machine's library with a Home Icon. It may take a while to share the contents of the library but eventually you can expand the first machine library and see all of the files. The Home Sharing feature makes use of BonJour so if you haven't been using BonJour for anything else, make sure that your firewall allows mDNS traffic (multicast, UDP - port 5353 or 5354) and make sure that it allows the iTunes data on port 3698 as well. You can check boxes to enable automatic sharing of purchased content and iTunes will offer to sync purchased content at that point. This didn't work for me, but as an alternative you can also view just the items from the first library that are missing from the second library and manually copy them. Its not clear that the playlists can be automatically synced. For versions of iTunes before 9, myTuneSync provides functionality that will periodically sync all of the items in iTunes except applications but including playlists. It will also sync bits of metadata like the skip count, play count, last play time, etc. I'm pasting an explanation of this feature I found on Apple's Support Forum. I haven't yet tried (I'm at the office), but I think this should do it. Credits go to "dryplatypus". After much frustration, I FINALLY figured it out. First, make sure all your computers are authorized to play each other's music. 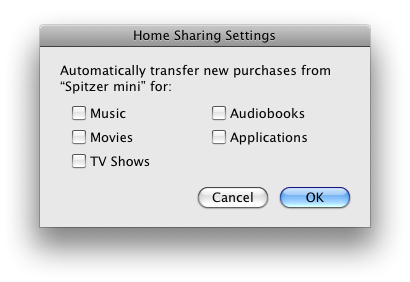 For example, click "Store" in the menu/task bar (at the very top) while in iTunes, then click "Authorize Computer...". Type in the other computers' (different) Apple/iTunes account and password. Do the same for your other computers. Second, click "Advanced" in the menu/task bar and then click "Turn Off Home Sharing" (assuming you already turned it on). Then, turn home sharing back on (again, by clicking "Advanced" but this time it'll say "Turn On Home Sharing"). Third, after turning home sharing back on, iTunes should prompt you to sign in into your computer's iTunes account (or you can sign in into other computers' iTunes accounts, but it doesn't really matter which account you use). Click "Create Home Share." --> FOURTH, on your other computers, repeat the second and third steps, BUT HERE'S THE IMPORTANT PART, sign in USING THE SAME iTunes account you used to sign in into the FIRST computer. Click "Create Home Share." Repeat these steps for every single computer you want to home share with. Now, all your computers that you activated home sharing with should show up under "Shared" in the source list on the left. BUT, make sure the little icon to the left of other computers is a picture of a little house, NOT the blue squares. After waiting for iTunes to load the computer's library, you should now be able to drag and drop any songs, movies, etc into your Library (in the source on the left). By the way, you might need to quit and reopen iTunes if other computers don't show up under "Shared". Also, make sure your firewalls are turned off. Use the same account "my@email" when turning on Home Sharing for your other computers. They will then appear below Shared in iTunes window. Not the answer you're looking for? Browse other questions tagged itunes home-sharing or ask your own question. What does the iTunes “Media Kind” actually do? Why does iTunes sometimes loose everything in the library when upgrading? How to Access iTunes Home Sharing and SMB Shares across 2 routers and local Networks?